“New Khmer Architecture and Japan” is the first show in Cambodian History to focus on the architectural drawings of its modern movement. Cambodia is a country with matured architectural culture, not only of the great Angkorian heritages and vernacular timber temples, but also of the modern buildings in 1950s and 60s called “New Khmer Architecture”. In the context of post-war redefinition of the national identity as well as the recent expansion of environmental consciousness, this Cambodian modern movement, with their sensibility to the traditional culture and tropical climate, is being re-evaluated since late 1990s; though the drawings and documents of the movement were believed to be destroyed and lost in the turmoil of the Civil War. Against this backdrop, researchers recently discovered original drawings and documents survived in Japan, including but not limited to the drawings of the masterpieces of Vann Molyvann, the central figure in the movement. In 1950s and 60s in Cambodia, thanks to the ingenious diplomacy of Norodom Sihanouk to balance both Western and Eastern Blocs, various foreign experts, from US, France, Germany, USSR and China for instance, took part in the modernization of the country. Among them, the role of French experts has been emphasized, such as Le Corbuisier’s collaborators, Vladimir Bodiansky and Gerald Hanning, who participated in the design of monumental Olympic Stadium in Phnom Penh. The exhibits of “New Khmer Architecture and Japan”, spots another light on the movement, revealing the unknown Cambodian-Japanese collaboration at that time. Cambodia and Japan have a lot in common, from Buddhism culture to Animism belief; and from the Monsoon climate to timber-construction tradition. Cambodian modernists could adopt Japanese architectural culture, with the assistance of Japanese experts, to blend them with own architectural style. Cambodian-Japanese connection becomes a key to open a new understanding and interpretation of New Khmer Architecture. The exhibits are grouped into two categories. The first group is from the projects by Ministry of Public Works and Telecommunications with Japanese collaboration, including the representative works of Cambodian modernist Vann Molyvann; Chaktomuck Conference Hall (1961), Sihanoukville Masterplan (1962), Grey Building (1964), National Theatre (1966), as well as the alternative proposal of Olympic Stadium in 1962 and the drawings of unbuilt Cambodian Parliament in 1959. The second group shows the diversity of Cambodian-Japanese collaboration in 1950-60s; Agricultural Pastoral and Medical Centers (1964); Tonle Sap Bridge (1966) and Osaka EXPO Cambodian Pavilion (1970). 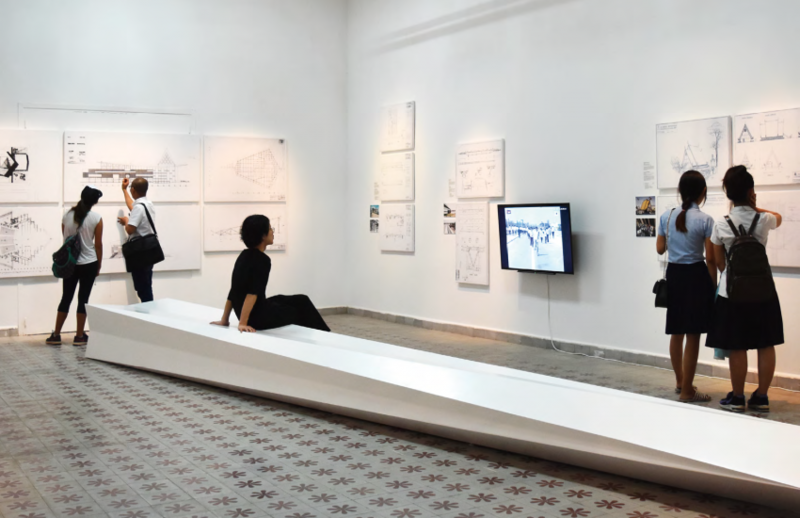 In addition, two new works are prepared for the exhibition; Special edition of the film “Beyond the Bridge” by Sotho Kulikar on so-called “Japan Bridge” over the Tonle Sap River; and the 1/2 scaled model of the column of unbuilt Parliament, reproduced through the interpretation of newly-discovered drawings, which serves as bench for the visitors.